The text below is my communication to the XB2 Xenobiology Conference in Berlin, on 24 May 2016. Xenobiology, according to Philippe Marlière, the chair of the Conference, is to Biology what Astronautics is to Astronomy, or also, an experimental branch of Metaphysics. The conference was organized by Philippe Marlière and the Isthmus team, within the context of the Leibniz Year, commemorating the 300th anniversary of the death of Gottfried Wilhelm Leibniz, the founding father of “the manifold of possible worlds”. Therefore, because Informatics is at the heart of Xenobiology, I had the honour of the first talk of the conference, Informatics in the light of some Leibniz’s works, in the historical building of the „Berlin Brandenburgische Akademie der Wissenschaften“ (Berlin and Brandenburg Academie of Sciences), an institution founded in 1700 by Leibniz himself as the (at the time) „Königlich-Preußische Akademie der Wissenschaften“. The science we are going to talk about, which encompasses algorithms, programming, operating systems, computer networks, databases and some others, is usually named in English “Computer Science”, but this wording seems to some people (including myself) quite inappropriate, because it is indeed a science, but not about computers. The German engineer and professor Karl Steinbuch coined the word „Informatik“ in 1957, the French engineer Philippe Dreyfus created the term « informatique » in 1962, both of them translated in English by “Informatics”, which, in my humble opinion, is better than “Computer Science”. This word collapses together “information” and “automatics” ; information is what gives to something a form from the inside of this thing ; automatics is what makes this process automatic ; the result is an automaton. The thing to which a form is given here is an idea, we call it an algorithm. We call the form a program, it is a text. As far as we can look backwards in time, humans have tried to build automates to avoid working. The trap of prehistoric man, whose door opens under or whose harrow falls on the prey, Vaucanson’s duck which was floating and swimming were automates. These particular automates, and some others of the same kind, do always the same thing. The kind of automates we are speaking about with Informatics are different, they have a language inside themselves, and they are therefore universal, they can do everything an automate can do, as proved by MM. Alan Turing and Alonzo Church (not everything can be done by an automate). These universal automates consist of a material object, a machine, a computer, and of an invisible, intangible thing, the program. The program, as we have told, is a text. Some programs define also a language, which is a meta-language regarding the intrisic machine language, and in which another program may be expressed. It is the way data processing machines are universal, and programmable. Gottfried Wilhelm Leibniz was a forerunner of these ideas, in several ways. The scientists who created the ideas of Informatics (Gottlob Frege, Alonzo Church, Alan Turing) were unaware of the previous works of their forerunner Leibniz. The scientist who invented the modern computer (another poorly suitable word for this device, and the French « ordinateur » is hardly better), John von Neumann, was aware of the works of Church and Turing in the field of Logic, but the link he saw between these works and the design of what we call today “von Neumann’s architecture” for the computer was very weak, if only present. He built a four-operations calculator (1672-1694), with a bug, like every true computer system. He had a foresight of how binary arithmetic could be suitable for automatic calculation (1703). His characteristica universalis, designed to be the language of a scientia universalis, didn’t achieve that result, but achieved another, showing that computing could apply not only to numbers, but also to logical propositions, an idea developed later, independently from Leibniz, by Augustus de Morgan, George Boole, Gottlob Frege and their followers. Moreover, the philosopher Baptiste Mélès established a correspondence between Object oriented programming (OOP) style and the Leibnizian concept of Monad. These deep insights of Leibniz, one of the most influential (even if often forgotten) thinkers of the millennium, towards the world of Informatics, are not just coincidences, but the outward signs of an often (not so) invisible current of thought, flowing from Aristotle to Kurt Gödel and Alan Turing, with the aim of substituting computing for reasoning everywhere it is possible. Alan Turing’s major work was to determine a way of computing where it is possible (and where it isn’t). Leibniz got the idea of making a calculating machine in 1672 in Paris, and later he learned about Blaise Pascal’s machine  when he read Pascal’s Pensées . Then he became eager to surpass Pascal’s machine, which was only capable of addition and subtraction, with the design of a machine able to multiply and to divide. He presented this design to the Royal Society of London on 1 February 1673, received much encouragement and was therefore admitted as a member. His first preliminary brass machine was built between 1674 and 1685. His so-called older machine was built between 1686 and 1694. The younger machine, the surviving machine, was built from 1690 to 1720 (according to Jan-Willem Liebezeit ). It is worthwhile to note that being able to compute the four basic arithmetic operations is equivalent to be able to execute any given numerical computation. For his design, Leibniz invented a mechanism to keep the operation’s multiplicand “in memory” : the “stepped reckoner”, based on a gearwork now called “Leibniz wheel”. The ability to keep data in memory is essential to modern computing, technically as well as theoretically. Leibniz’s machine was the first device ever to implement that capacity. There was a bug in Leibniz’s design : a flaw in the carry mechanism prevented the machine from accurate computations with numbers of two or three digits. And, like Pascal before him, and like Babbage after him, Leibniz had difficulty obtaining the precision gearwork needed by his machine to work reliably. If for ancient Chinese people the two kinds of lines were the symbols of yin and yang, they may be also viewed as the two digits of binary arithmetic. Three lines of two kinds may give eight combinations, for the numbers from 0 to 7 (23−1). Fuxi’s hexagrams may, with six binary digits, may be viewed as representing the numbers from 0 to 63 (26−1). Leibniz was neither the first to know Fuxi’s hexagrams, nor the first to know binary arithmetic : Thomas Harriot (1560-1621) left a table of binary values, and Juan Caramuel y Lobkowitz (1606-1682) had studied numeral systems with radices (bases) different from 10. But he was the first one to see a connection between them. Establishing this expression of numbers enables us to very easily make all sorts of operations. With the binary numeral system, the multiplication becomes extremely simple, because the only multiplication table is the table of one time one. But moreover the digits 0 and 1 may represent either their numerical values, or the values “false” and “true” of the algebraic logic invented by George Boole in the middle of XIXth century . ⇐⇒ is a metalogical symbol meaning “can be replaced in a logical proof with”. Modern computers are indeed very simple devices, more simpler than mechanical machines designed by Schickard, Pascal, Leibniz or Babbage. As mentioned above, they are all made of NAND circuits (the usual wording is “NAND gate”). They consist essentially of a memory, which is a storage to store values coded by binary digits, an arithmetic and logical unit (ALU), which joins together logical circuits to implement arithmetic and logical operations, and a control unit with control operations (technically similar to logical and arithmetic operations) to trigger the execution of operations on the right order, at the right time. to store data from registers into memory. to combine data according to boolean operations ; the result of such a combination may be an arithmetical operation. As all data are numerically encoded, all operations on data, numerical, textual, graphic or whatever, are arithmetic (i.e. logical) operations. The computing system we have described so far is set up from many pieces, all of them are quite simple, but to work efficiently with it we need to put them together in a coherent way. The way to achieve coherence is language, and here too Leibniz had the right ideas. Unfortunately, almost everybody was unaware of them, and they had to be reinvented by people like Gottlob Frege, Alonzo Church, Alan Turing and some others. And also, the authors of the first computer languages like John Backus were originally unaware of the works of Frege, Church and Turing, and they had to be rediscovered later. In fact, the need for true languages was not evident in the first place. When John Backus invented Fortran, he was thinking of mathematical formulas. Later, with the Algol project, the idea of language came up. Behind the computer languages is the idea of formal system. A formal system consists of a finite number of rules which operate on countable sets. Before the modern formal systems, Leibniz had the idea of a characteristica universalis, a language for a scientia universalis. Leibniz hasn’t written a formal treatise upon this project, his ideas about it are spread out in many unpublished papers and letters, and Louis Couturat  and Bertrand Russell  deserve the credit for putting them in light. I’m borrowing from Renée Bouveresse  her description of Leibniz’s program for an universal science ; it consists of two parts : an universal characteristic, or notation system, to write down any information item without ambiguity and to help for communication between scientists, and a calculus ratiocinator, or formal method for reasoning, because calculus is nothing else as an operation by means of characters, which is relevant not only for quantities, but also for any sort of reasoning. These ideas of logical calculus are exactly the ideas inherent to computer programming. “Object-oriented programming (OOP) is a programming paradigm based on the concept of objects, which may contain data, in the form of fields, often known as attributes ; and code, in the form of procedures, often known as methods.” (Wikipedia). This style of programming, as opposed to procedural and functional styles, avoids sharing data between procedures or passing arguments between them. Procedures and data are encapsulated into so-named objects which communicate between each other by message exchange. The messages contain data and indication of the methods that the emitting object asks the receiving object to apply to the data. According to this model of program, an object may receive messages, which modify its status, and send messages, which tend to modify other objects, i.e. the world around . Baptiste Mélès noticed  that an analogy could be built between this behaviour of objects and some properties of Leibniz’s monads : “The qualities of a monad must be its perceptions ; a perception is a representation in something simple of something else that is composite. And a monad’s actions must be its appetitions, which are its tendencies to go from being in one state to being in another, i.e. to move from one perception to another ; these tendencies are the sources of all the changes it undergoes.” (Translation by Jonathan Benett) . In his paper Baptiste Mélès gives to us some examples of objects in Java. He notices that the programmer, in this world of classes (types) of objects, occupies the place of God, because he knows (he’s supposed to know…) everything about all classes. OOP gives us objects able to communicate between each other : this property could help to elaborate models around the notion of biological function, which is the reason some object or process occurred in a system that evolved through a process of selection or natural selection. Leibniz’s work is immense, he approached numerous domains with thoughts well in advance on his time, and some of them are still to be discovered and understood. It is a pity that Voltaire, a by far lesser philosopher, could have mocked him with cruelty, and moreover after his death, in his novel Candide, where he is painted as the philosopher Pangloss, whose mantra is “all is for the best” in the “best of all possible worlds”. If, as stated by Roland Barthes, Voltaire belongs to the Academy of the overrated, it is not the case for Leibniz. It is still to be well established that the science of Informatics is the daughter of Logic, probably more than of Mathematic. According to the German logician Heinrich Scholz, in the science of Logic there are two periods : from Aristotle to Leibniz, and from Leibniz until now, because Leibniz introduced new ways of logical calculus. Almost nobody was aware of Leibniz’s works on Logic, and it is only in the second half of the XIXth century, when similar ideas arose (de Morgan, Boole, Frege…), that they were discovered. In any case, Leibniz’s writings on Logic and Calculus would be of great help for informaticians to better understand their science. 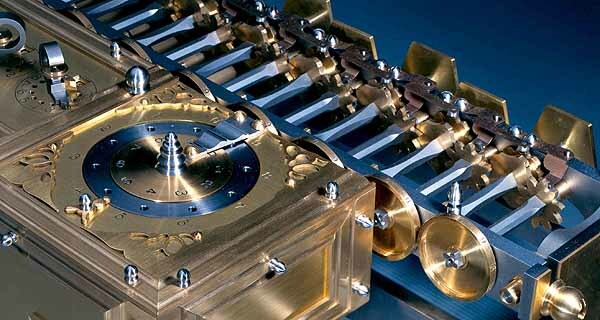 Pascal began to work on his calculator in 1642, but the first mechanical calculator was designed by Wilhelm Schickard. Schickard’s machine was destroyed by fire, but we know it by two letters to Johannes Kepler from 1623 and 1624. « La machine arithmétique fait des effets qui approchent plus de la pensée que tout ce que font les animaux ; mais elle ne fait rien qui puisse faire dire qu’elle a de la volonté, comme les animaux. » (“The arithmetic machine has effects that are closer to thought than what all animals do, but it does not do anything that could make some say it has a will, as animals have”), Blaise Pascal, Pensées, Fragment 741 (Lafuma), 617 (Sellier), 340 (Brunschvicg), 1670. The translation in English is here, by Lloyd Strickland. In the beginning, OOP gave rise to great enthusiasm, it was supposed to give computer programming the power to represent the real world. It was of course an illusion, computer programs artifacts can only represent, manage and process information, and OOP is a particular way to do that. But OOP may be a programming style well suitable to build abstract models of some real world’s objects. Gottfried Wilhelm von Leibniz. Principles of Nature and Grace Based on Reason. Translation by Jonathan Bennett. Early Modern Texts, 1714. Gottfried Wilhelm von Leibniz. Principes de la Nature et de la Grâce fondés en raison - Monadologie. Garnier-Flammarion, 1714. Jacques Bouveresse. Essais V - Descartes, Leibniz, Kant. Marseille : Agone, 2006.